On October 22nd our Spring Day Retreat was held at the beautiful Highfield House in Stanley. The theme of the day was exploring our heart aspirations: that which truly matters to us and what our heart most longs for. Spring represents new beginnings and is the perfect time to plant the seeds of what we would like to cultivate more of in our lives. When living a life that is not aligned with our hearts aspirations we suffer. Perhaps our heart longs for meaningful connection with others: without it we may feel lonely and isolated. Or maybe our heart longs to feel inspired and uplifted by our work: without that perhaps we feel stuck in a rut or helpless about our situation. It's easy for us to say yes to taking care of everyone else due to social pressures and believing we should if we're a good person that we can forget about what we truly want for ourselves. We are driven by guilt. We can become so busy doing all of the things that we feel we should be doing that we forget about what most matters... Or what our heart truly longs for. At the Spring Day Retreat we invited each person just for the day let go of the high expectations we (and society) place on ourselves. To let go of all of the beliefs that we should be doing and achieving more: at work, as a partner, friend, parent, sibling, employee. Those beliefs that we're not good enough right this moment or not achieving enough can often lead to feelings of shame, unworthiness, fear and anxiety. These feelings can often be what drive us to make reactive decisions (that aren't in line with our hearts aspiration) in order to move away from the pain or discomfort as quickly as possible. They can get in the way from us choosing what is truly matters and we become disconnected to what values, relationships or desires have the most meaning for us. It happens to the best of us, especially in times of stress. Close your eyes for a moment and just think of something stressful that is occuring in your life right now. Can you name those feelings? Perhaps it's a burning, hollow sadness... Or a tightening or squeezing in the chest... Or a gripping in your neck and shoulders. While these feelings may be unpleasant they are part of life too - they are not bad or wrong - but when we are not aware of the effect those feelings have on us we can make reactive choices to move away from those unpleasant feelings as quickly as possible and this occurs almost outside of our awareness when we are locked in fear or stress. We can choose to create what we want from our wisest self - our "heart-mind" - by bringing these feelings of shame, fear, anxiety into awareness and by making space for them through meditation and reflection. To just be present with our suffering or stress or fear we are then not controlled by it, we can observe it rather than being carried away by it. This then allows us to make decisions for our lives based on what we are truly aligned with in our heart and to live more wholeheartedly. This is the power of mindfulness! "Repeated thoughts and stories are almost always fueled by an unacknowledged emotion or feeling underneath. These unsensed feelings are part of what brings the thought back time and again. Future planning is usually fueled by anxiety. Remembering of the past is often fueled by regret, or guilt, or grief. Many fantasies arise as a response to pain or emptiness. Mindfulness allows us to recognise our most common subconscious beliefs or thoughts (outside of our awareness) that may trigger this type of thinking pattern. For example relationship issues may evoke a vulnerability that we are unlovable just as we are. These beliefs may not necessarily be true, but they certainly feel real in our bodies and it's only natural that we want to move away from them quickly. In the above example we may find it hard to show our true self to others as we may believe that if we're not perfect we won't be loved. Although logically we may know this is not the case, our subconscious mind can keep us locked in feelings of shame and therefore we make choices to not be vulnerable or open with those we love, even though what we may be craving most in our hearts is an authentic connection with those we are closest to. Mindfulness helps us to relate more kindly and compassionately to ourselves and therefore to others as well. It enriches the relationship with ourselves and those we most love. 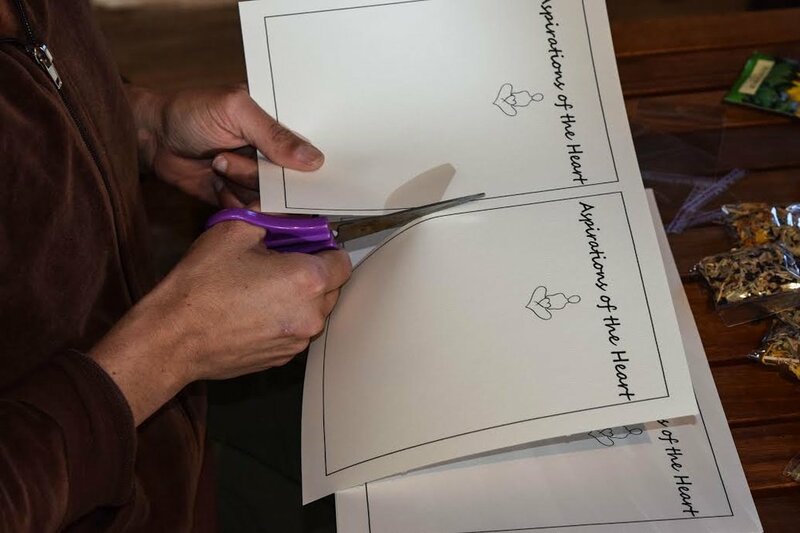 We invite anyone to join us in this process - it's a wonderful way to practice gratitude, to develop a practice of choosing what our heart most desires and to live more mindfully and wholeheartedly. Each person was given a bag of treats to take home and that contained some sunflower seeds to be planted as a symbolic way of taking care of the aspirations. We also provided a space to record aspirations and invited each person to place this where they would frequently see it. Our next Day Retreat is on February 25th and is the Summer Day Retreat. We will be exploring Mindfulness Meditation and Compassion in detail as well as enjoying Pilates and yoga (mindful movement), some relaxation time and a seasonal vegan feast. You will be given resources to take home for ongoing practice. If you wish to start using meditation in your life to help with stress management and improving your wellbeing but are not sure where to begin this will be a wonderful opportunity to learn a new practice that can enrich your life and your relationships.